In 2001, the SEC was created with the goal of seeking clear and specific sustainable initiatives through student voice, education, and empowerment. To achieve these goals, SEC convened the first Earth Summit in 2002. They brought students, faculty, staff, administrators, and community members together to discuss the state of sustainability at UC Santa Cruz. Of many notable accomplishments that first Earth Summit manifested, it first guided Earth Summit participants to form working groups and the Chancellor's Sustainability Action Council (CSAC), a supporting group designed to "help institutionalize and coordinate the ongoing efforts of the working groups." Together, these working groups and CSAC sought to spark important conversations and put projects identified at Earth Summit into action. Today, Earth Summit remains on of the longest running events on campus. And while we do focus on sustainability each year, we change the focus and theme to reflect current campus and global issues. A HUGE THANK YOU TO EVERYONE THAT ATTENDED AND A SPECIAL THANK YOU TO OUR AMAZING PRESENTERS! 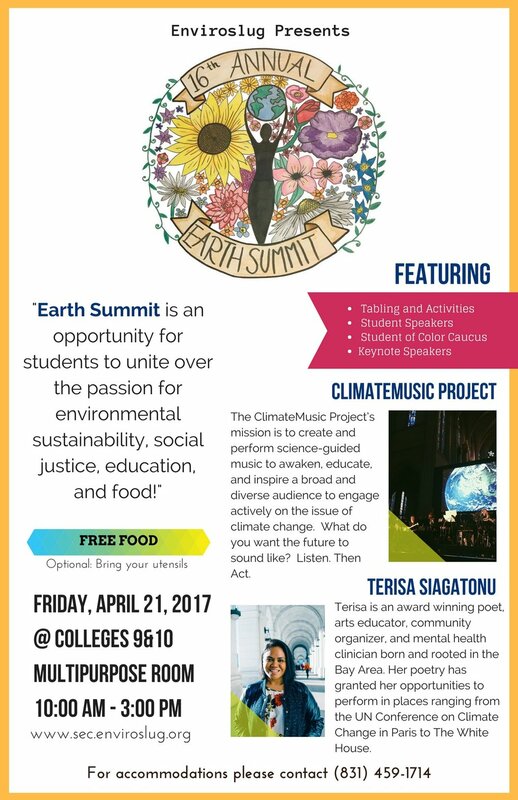 This year's Earth Summit focused on the current crisis at UCSC in which students are being forced to fight for their basic rights. Earth Summit was an opportunity for students, alum, faculty, and community members alike to come learn how the current enrollment crisis at UCSC has permeated every aspect of students' lives and what folks can do to get involved in the movement to fight it. Speakers and workshops helped give attendees methods of enacting change on and off of campus. Amah Mutsun Tribal Band Leader, Valentin Lopez spoke on the history of the land UCSC is on and helped the SEC reveal the Mission Bell petition we worked with the Amah Mutsun to create. Students learned about food and housing justice on campus from members of SUHWG. Attendees participate in our direct action station where they could sign petitions, register to vote, and comment on the Student Housing West environmental impact report. We also be featured our 4th Annual Student of Color Caucus and Whiteness in Sustainability workshop in order to engage in the conversation about racism within the sustainability movement and on campus. Students, faculty, and community members gathered to discuss campus sustainability and students' basic needs. The Climate Music Project performed an original musical piece composed to correlate with the increase of CO2 in the atmosphere over time. We released the 2016-17 printed copies of the Blueprint for a Sustainable Campus at this event! And as always, we enjoyed good food! Tabling includes seed planting, recycling game, make your own deodorantcampus expansion trivia, write your representatives, and more! Thank you for joining us! Earth Summit is a free event. Folks are welcome to Drop in anytime!